The San Jose Blog: First San Jose Aloft Hotel Coming in 2014! 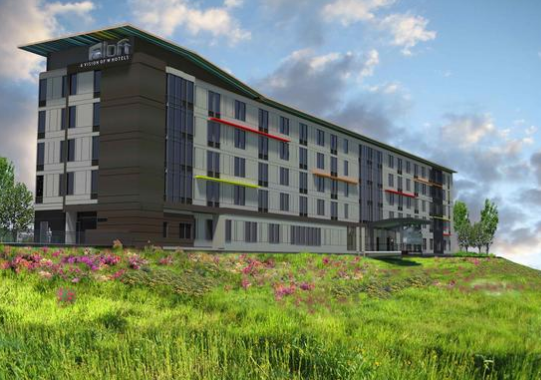 First San Jose Aloft Hotel Coming in 2014! One of my favorite hotel brands is finally coming to San Jose. Aloft is part of the Starwood chain, which also includes Sheraton, Westin, W Hotels, St. Regis, Four Points, Le Meridien, and Element. Aloft hotels are designed by the same people responsible for the chic and modern W Hotels brand, except these rooms are a bit smaller and much more affordable. Where Aloft really excels above other brands is technology. Each room is guaranteed to have a large LCD screen with HDMI inputs, USB ports, lots of outlets, etc. Even the reception area of these hotels are tech friendly and seem more like a break room at Google than a hotel lobby. Aloft has also started a new pilot program where frequent guests get a permanent key and receive a text message with their room number 24 hours before arrival so that they do not need to check in. The San Jose Aloft is going to go next to the America Center, which houses the corporate headquarters for Polycom and Flextronics. This also happens to be a stones-throw away from the new 49ers stadium, Santa Clara's future entertainment district, and massive new office developments currently under construction. The hotel clocks in at 175 rooms and five stories, and also shows that you can build a budget-friendly low rise hotel that does not look like crap (hope Hampton Inn is paying attention). Also, those colorful horizontal bars are filled with LEDs that light up at night and look really slick. It's also great to see how Starwood Hotels have been expanding in San Jose. Just five years go there were ZERO Starwood hotels in San Jose proper. Even the "San Jose Sheraton" is in Milpitas. The Hotel Montgomery in Downtown San Jose was converted to the nicest Four Points Hotel in the world and became our first Starwood. Then a new Four Points opened in South San Jose off of Bernal and 101 late last year. The Westin San Jose is opening Downtown in November of this year. And now we get an Aloft for 2014. I hope the trend continues, I'm a big fan of the Starwood chain.